Dr. Moreno graduated from the Colombian School of Medicine “Bosque University” in 1993. He then completed a residency in Orthopedic and Trauma surgery where he received a National Research Award. In 2001, he completed a one-year fellowship at the Christine M. Kleinert Institute for Hand and Microsurgery in Louisville, Kentucky then continued as a Senior Fellow until 2004 and ultimately as Hand Scholar. 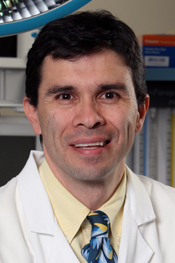 In February 2004, Dr. Moreno joined Kleinert Kutz as staff. In addition, he accepted the appointment as physician to the Commission for Children With Special Health Care Needs. He was appointed Assistant Clinical Professor with the University of Louisville Department of Surgery, Division of Hand Surgery. His special interests include distal radius fractures, wrist arthroscopy, elbow pathology, and congenital surgery.